Galleries and museums in cities across Holland are hosting exhibitions celebrating the Dutch Golden Age during 2019 to coincide with the 350th anniversary of artist Rembrandt van Rijn’s death. The Netherlands experienced a period of unparalleled creativity, confidence and prosperity during the 17th century. For the Dutch it was a golden age. Works by artists such as Rembrandt record the faces and clothing of people alive during that buoyant period. To gain an understanding of how that era came about, it’s worth delving — briefly — into the history of the Netherlands. The Dutch Republic’s independence from Spain was officially recognised at the Peace of Muenster in 1648. The struggle for self-determination had been long. Using the benefit of hindsight, historians now term the conflict once known as The Dutch Revolt as the Eighty Years War. At the beginning of that bitter conflict the Spanish gave subjects in what is roughly the same as today’s Belgian territory the option of leaving. That prompted many Flemish people to move to cities such as Amsterdam, Haarlem and Leiden. Many of those individuals were industrious, wealthy and ambitious; their talent, resources and determination helped act as a catalyst for the economic and creative boom in the decades that followed. Detail from The Syndics of the Drapers’ Guild, also known as The Sampling Officials, painted by Rembrandt in 1662. Rembrandt Harmenszoon van Rijn, was born in Leiden during 1606, and recorded some of the most vibrant decades of what is now termed the Dutch Golden Age. He created his first works in the city of his birth — the location of the oldest university in the Netherlands — then moved to Amsterdam. He lived and worked in the capital of a flourishing maritime empire. Between 1639 and 1658 his base was in Antoniebreestraat (today known as Jodenbreestraat), where the Rembrandt House Museum now exists. That popular attraction brings to life aspects of the era in which he lived. His artistic success led to many notable commissions, but his spending outstripped his income. Rembrandt was declared bankrupt. From a historical perspective that personal misfortune has resulted in an insightful legacy into his household and lifetime — the inventory of his belongings which was drawn up to facilitate their sale. Dutch Golden Age artworks are an integral feature of the Dutch cultural landscape. Drawing upon an ostensibly contemporary theme — social networking — the Rembrandt House Museum is hosting an exhibition entitled Rembrandt’s Social Network from 1 February to 19 May. It explores how the artist made use of contacts to acquire commissions and sell works, and who he turned to for support during times of financial difficulty. From 7 June to 1 September works by artists of the calibre of Pablo Picasso and Edgar Degas will be among those displayed in the Inspired by Rembrandt exhibition, drawing on artworks from the museum’s collection of paintings by creatives who were influenced by the Dutch Master. From 21 September into 2020, the museum will host Laboratory Rembrandt, an exhibition exploring the artist’s innovative techniques of etching and painting. Bed in the Rembrandt House Museum in Amsterdam. The Rijksmuseum, which conveys the history of the Netherlands and displays artworks from the Dutch Golden Age and beyond, is also located in Amsterdam. The grand building was designed by Pierre Cuypers, who was also the architect of the Dutch capital’s central railway station. Bas relief figures adorn the façade of the Rijksmuseum, whose Gallery of Honour was built to give pride of place to Rembrandt’s The Night Watch. The masterpiece dates from 1642 and, more formally, is known as Militia Company of District II under the Command of Captain Frans Banninck Cocq. At the time it was an unconventional way of depicting a group, and was no means universally loved. When the painting was hung in Amsterdam Town Hall in 1715 it was trimmed down — something that no serious art curator would today contemplate as anything other than an act of vandalism shedding millions from work’s value but was then seen as a practical solution. From July 2019 the painting will be restored while still on public display while in a glass chamber. If you can’t get to the Rijksmuseum during the 10-week restoration you can watch online. The restoration work (which is estimated to cost approximately $3.5m) will be streamed live. Prior to that, All the Rembrandts, from 15 February to 10 June, will see the Rijksmuseum’s entire collection of drawings, paintings and prints being exhibited together. The museum holds the world’s largest collection of works by Rembrandt. Facade of the Rijksmuseum in Amsterdam. Back in Leiden, Rembrandt’s city of birth, the Museum de Lakenhal will reopen to the public, following major renovations, on 20 June. The new exhibition wing will host the Young Rembrandt: 1624 – 1634 from 3 November. Loans from several international museums will feature in the much-anticipated exhibition. Dutch Golden Age style figure on the roof of the Frans Hals Museum in Haarlem. In common with Rembrandt, Frans Hals inspired many Impressionist and Post-Impressionist artists. Hals moved to Haarlem from Antwerp as a boy, living until 1666. After his death his works fell into relative obscurity for two centuries, until they were rediscovered by a French art critic who wrote under the pseudonym W. Bürger. Artists such as Vincent van Gogh, John Singer Sargent and Édouard Manet took inspiration from Hals’ loose brush strokes, rapid way of working and use of raw colours and gradations in his portraits. Works by those and other renowned artists feature in the exhibition Frans Hals and the Moderns, was featured at the Frans Hals Museum until 24 February. Detail of a Rembrandt self-portrait at the Mauritshuis in The Hague. William of Orange — who was also known as William the Silent, partly because of his inability to speak Dutch well — was a figurehead during the early years of the Dutch Revolt and his tomb is within Delft’s Nieuwe Kerk. That name means ‘new church’ yet the building’s construction began in 1396. An exhibition about William of Orange’s life and legacy was held at the Museum Prinsenhof Delft until 3 March. William’s court was within the building that now hosts the museum. Two bullet holes, in the wall by the staircase leading from the ground floor, are a reminder of his assassination within the building. From 11 October the museum will host an exhibition about the life and works of artist Pieter de Hooch, a Golden Age master who is often overshadowed by another Delft resident, Johannes Vermeer. The Vermeer Centre, on Voldersgracht, tells the story of the artist’s life and displays facsimiles of his paintings. Sculpture of Vermeer’s The Milkmaid painting in Delft. The sculpture is by Wim T Schippers. 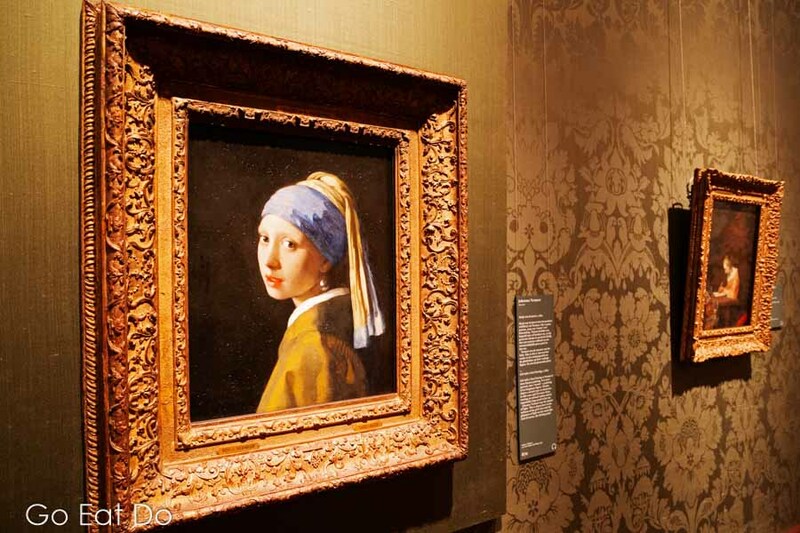 The original version of Girl with a Pearl Earring — the painting which inspired a movie of that name, starring Colin Firth as Johannes Vermeer — is displayed at the Mauritshuis in The Hague. All 18 of the museum’s paintings attributed to Rembrandt — including The Anatomy Lesson of Dr Nicolaes Tulp, which conveys an aspect of the scientific progress made during the Dutch Golden Age — will be displayed from 31 January to 15 September in the exhibition Rembrandt and the Mauritshuis. Facade of the Mauritshuis in The Hague. Meanwhile in Dordrecht, the Dordrechts Museum will host Work, Pray and Admire, until 26 May. The exhibition explores the relationship between the beliefs that became established during the Dutch Golden Age and art. Works by Vincent van Gogh and Ferdinand Bol count among those that are on display. 2019 promises to be a golden year for anyone travelling to Holland and interested in Dutch art. Girl with the Pearl Earring on display in the Mauritshuis. While researching this subject, Stuart travelled between Newcastle International Airport and Amsterdam Airport Schiphol with KLM Royal Dutch Airlines. KLM operates services between Schiphol and regional airports across the United Kingdom. For further information about the Dutch Golden Age and attractions in the Netherlands, see the Visit Holland website. Stuart Forster, the author of this article was named Journalist of the Year at the 2019 Holland Press Awards. Photographs illustrating this post are by Why Eye Photography. Call 07947 587136 to commission a shoot. To sponsor a post on Go Eat Do, please get in touch. Use Pinterest? Pin this post about exhibitions to celebrate the Dutch Golden Age for later! The photo shows houses in Amsterdam.